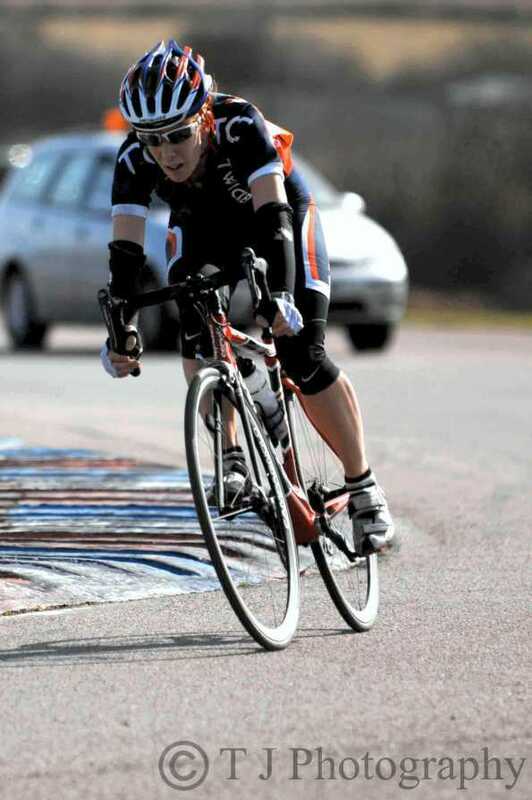 Steve Home contested the afternoon 2/3 race at Alfold, and came home very satisfied with a great 4th place. "A good day for me. I sat tight near the back for most of the race, enjoying the sunshine and chatting with Richard Collins and Simon Whitten. The last place I want to be at the start of a 75 mile race is up the road! It appeared that all the attacks would come to nought, but eventually Niall Digby (Sigma Sport) and Marcus Brueton (Norwood Paragon) managed to get away and out of sight. As we commenced the final lap (approx 13 miles to go), things started to become a bit more lively with Richard Prebble (Candi tv) being the main protagonist. Just before we passed the HQ for the final time (9 miles to go) I moved up on the outside towards the middle of the bunch. A chasing break started to form with Prebble, Nigel Carpenter (Norwood Paragon), Angus McAllister (Norwood Paragon) and a couple of others: one from Wildside RT, another from Kingston Wheelers. The gap was small, maybe 50 metres or so, but the head of the peloton seemed to be slowing so I moved up along the outside and launched myself across the gap. Just before I bridged I glanced over my shoulder expecting to see the bunch strung out in a long line behind me, but I was clear! We weren't the best organised breakaway in the world, but we soon reeled in Niall and Marcus. With two miles to go the through and off broke down completely and the attacks started. Angus McAllister was the first to go and no one followed. With about 1km to go (although I didn't realise we were so close to the end - doh!) Richard Prebble put in a huge effort. Nigel Carpenter took his wheel and I chased Nigel, but was probably a bike length down by the time I got the legs moving. I dropped the wheel just before the finish came into site, but fortunately no one had my wheel. Carpenter went on to pass Prebble and then McAllister just before the line. I think McAllister was 2nd, Prebble 3rd and I was 4th. My best result of the year. I am well chuffed, although given how fresh I was, I really should have held Carpenter's wheel and gone for the win." Natalie Creswick, Will McFarland, Tom Sutherland, Matt Myers, & Stewart Ward rode the morning 2/3 H'cap event. Official results not yet published, however Natalie scored a fine 7th place, with Will, Stewart, & Matt not far behind..
"It was good fun and reasonably successful. I set off in the front group with the cat 4s and we whittled the group down to about 12 of us and worked well together to keep away from the cat 3s. We did have a big advantage of 7 minutes over 45 miles though so they had a lot of work to do to catch us up. I came in 7th in the sprint to the finish, a bit annoyed as think I could have placed higher but there was a touch of wheels in front of me so had to slow down and start the sprint again. I pipped one guy on the line though which I was quite happy with (he was not so happy). Stew, Will and Matt were in the cat 3s and they came in about 3rd, 4th and 5th in their sprint so expect we are all in the top 20. Tom Sutherland had to drop out halfway through as he wasn't well and he had also messed up his car hire return time so had to dash off. He had brought friend with him, also called Tom, and he was doing really well in our front group but unfortunately double punctured with one lap to go. 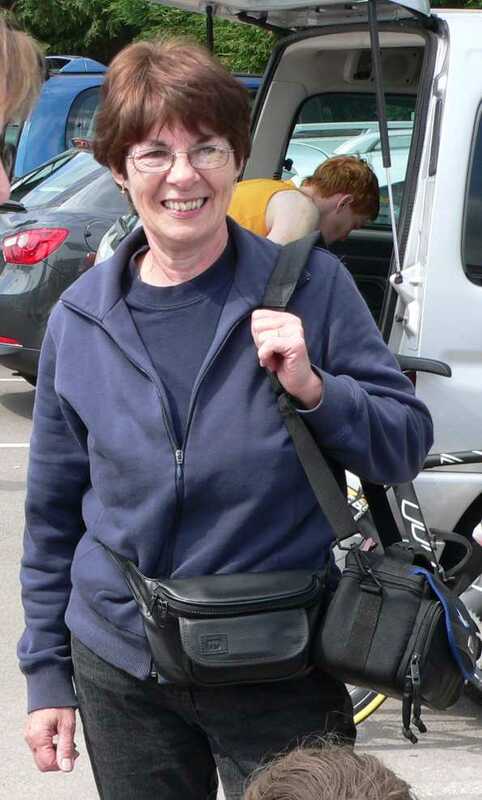 I had done a really hard ride at the legs of steel cyclosportif on Saturday so my legs were far less than fresh so hadn't expected to be able to do anything exciting but it was a good course and it was good to ride with men and get a faster ride." "The 4ths got a 7 min head start in a race that took the 3rds 1 hour 40. They were well organised and a lead group stayed away, shedding off stragglers continuously. Natalie came 7th or 8th. 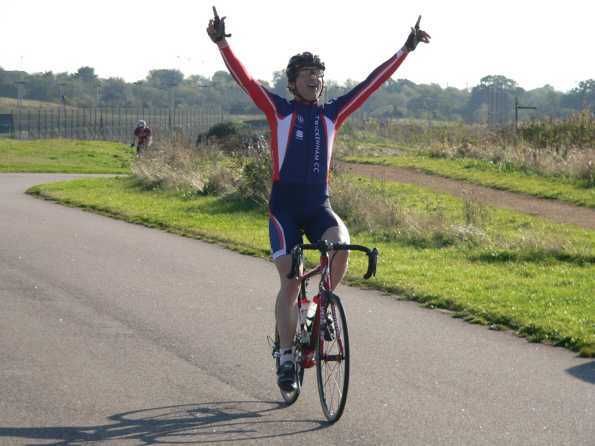 I came 4th in the 3rd cat bunch sprint, about 3-4 mins behind the winners. 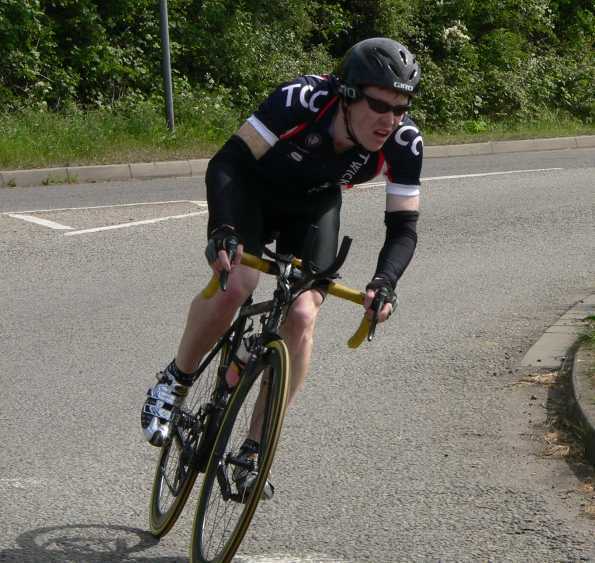 I pipped Stewart Ward (racing as Ful-on-tri but in TCC kit) on the line. Matt Myers was mid-pack having pulled his foot out with a mile to go. Tom had made an error booking his hire car until 12 (!!) and unable to move the time when he did maths on arrival at the course, he spent one lap on the front trying to lead and organise the chase (to no avail) before going home." We are placed 6th (of 45) in the Central Region table, with the possibility of a higher placing once this weekend's results have been processed. Well Done Team Twickenham ! 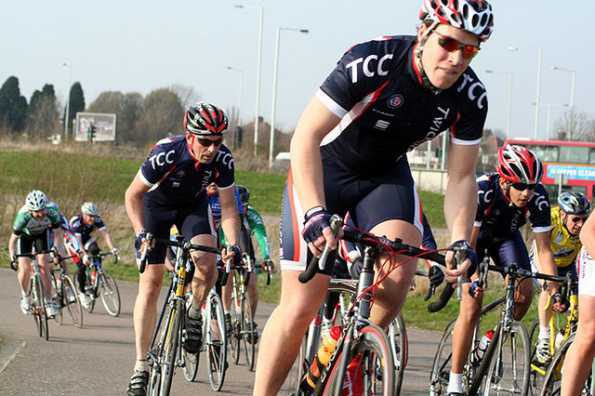 Turbo training for the autumn and winter season starts on Tuesday 29th Sept at the clubroom. Kick off is 7.30pm so arrive about 10 mins beforehand to get set up. We have around 18 turbos available to loan but you are welcome to bring your own if you wish. Don't forget to bring a botte of your favourite energy drink for during and a recovery drink for afterwards. Bring a sweat towel to cover your handlebars so your sweat doesn't corrode your stem etc. In the first session we will be doing some 20 second, one minute and three minute flat out efforts and learning just how hard those efforts should be.